Cyprus Property Blog by Cleo : Great Views in Armou - Even Better Price - Only 119,000 Euros! NOW SOLD! • 3 bath, 2 bdrm 2 story "Sea and Coastal Views from both" - €119,000 EUR - Stunning Views - NOW SOLD! Armou, Paphos - This end, two bedroom townhouse is located in a peaceful and tranquil Cypriot village of Armou, 10 minutes drive from Paphos Town. 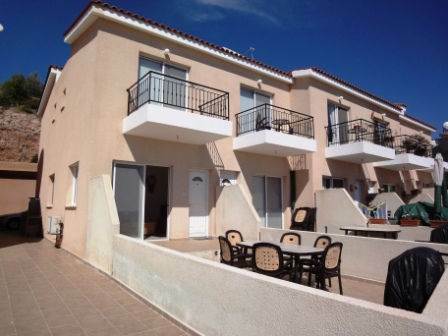 The local amenities such as taverna, coffee shop and mini market are within walking distance. Armou is elevated above Paphos and so the views in this area are absolutely spectacular. The ground floor features an open plan lounge, dining area and well equipped kitchen. Off this area is a guest toilet and large storage cupboard. There is lots of light with windows at the side and patio doors from the lounge leading on to a spacious split level veranda with terrific views – great for outdoor dining. Upstairs there are two good size double bedrooms with fitted wardrobes. The first has an en-suite shower room and balcony with the most stunning countryside and coastal views. The second bedroom with en-suite bathroom also has it’s own balcony. The fantastic views can also be enjoyed while relaxing by the communal swimming pool. Here there are shower facilities and the pool is easily accessed via roman steps. This is an ideal property for someone who wants a peaceful setting and yet not far from all the amenities. It is being sold fully furnished and is ideal as a holiday or residential home. The price represents exceptional value for money. It won't last long at this price!